Definitely one of the more popular coin rings here. The first 1000 yen coin was issued in 1964 to commemorate the Tokyo Olympics. The coin is perfect especially when antiqued to show off it's beautiful Cherry Blossoms with Mount Fuji in the background. 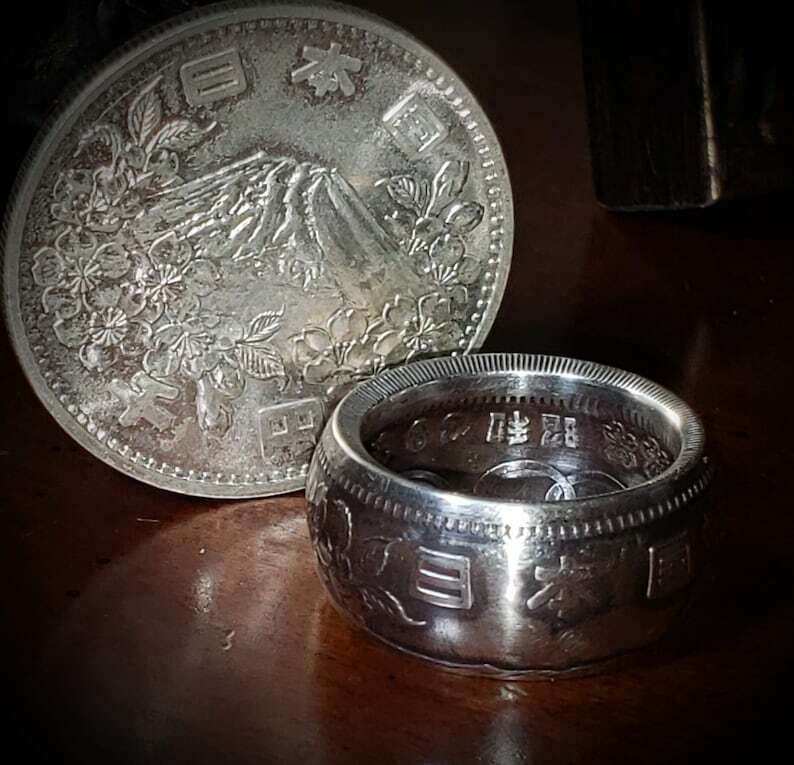 The deep impressions from the Japan mint allows for incredible foreground / background contrast and is loved by all whether Japan has a special meaning for you or you just want one of the most beautiful coin rings offered. - Photographed in "Light Antique Patina"
- Photographed in "Thin Band" which is approx 10mm wide however if requested, I do have a wider cut that would increase the width of the band to 13mm wide. - Your Choice of Dome or Straight Wall Style (see photos above). Let me know if you have a preference of a Domed Sided band or a Flat Sided Band (both photographed above) otherwise I'll just make what I feel looks best in your ring size. Fantastic rings. I cant get over how amazing they look, I can't rate highly enough!